Every one of us is blessed with a unique face which is our identity. This face carries us through our entire life and is the first identification we have. So when there is severe damage to the skin in terms of hyper-pigmentation, photo aging, age spots, and skin darkening, it is natural to feel upset or lose confidence. However, if this loss of confidence starts acting up in your daily life, then it is a cause for worry. But we have a solution that takes care of this problem and repairs your skin to look younger and brighter. Melorg Cream is an effective skin cream which fights skin darkening and spots. The three active ingredients in Melorg are Beta White, Tyrostat, and Melanostatine. Beta White is a complex combination which differs from other whitening agents and decreases constitutive and facultative pigmentation allowing optimum whitening and lightening effect with an excellent afety profile. Melanostatine competes against the natural ligand on its specific receptor by preventing any further activation of the tyrosinase and thus blocking melanin synthesis. Tyrostat is an extract of a plant from northern canadian plantations which have strong inhibitory effect on the Tyrosinase enzyme. This enzyme is responsible from the red-brown pigmentation and thus darkens the skin. Melorg Cream s developed by Medcure Organics which is one of the top derma companies in India as well as a very successful PCD Derma franchise. It has a strong presence in Gujarat, which is one of the western states in India. It is India’s westernmost state and is known for its varied terrain and several tourist attractions. Gujarat boasts of a number of sacred sites and hosts the famous Sabarmati Ashram in Ahmedabad. With a population of over 6 crores, the most famous part of Gujarat is its food. Gujarat has an active industrial corridor with several international businesses housing their manufacturing units in Gujarat. Gujarat has made headlines with its renewable energy projects all across the state and has provided a map for the rest of the country. Medcure happily serves the several facets of Gujarat with its wide range of products. 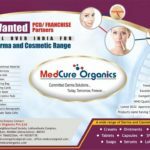 Medcure Organics is a fast growing Derma PCD company with a vision to create and distribute products that address real issues. Medcure Organics is committed to increase access to high quality healthcare products across India. 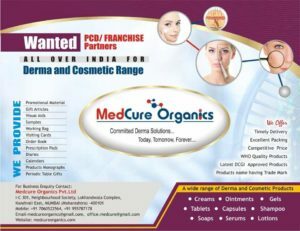 Medcure has a presence pan India and is looking for franchises to be a part of the vision and ensure high quality healthcare all across the country. If you are someone with the vision for a successful PCD franchise, contact us for Derma Skin PCD Franchise in Gujarat options and product details.